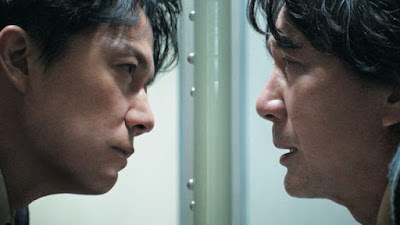 Hirokazu Kore-eda’s Third Murder is not something you’d expect from someone known for carefully crafted family dramas. Who would have thought he’d suddenly show up with a court room mystery? Then again lurking at the heart of the film are various family dynamics. Brought in after the defendant has confessed, and everything looking like a slam dunk for the prosecutors, a defense attorney takes the case of man who has confessed to the killing. As he begins to work on a defense, hoping at the very least not to get the death penalty, things begin not to add up. Sure his client could have done it, and there is evidence to point to his doing it, but he can’t tell the same story twice. Every telling has another twist. Worse the background of the man and outside factors make it look less and less likely that he did it. As with Kore-eda’s best work this is a family film. At its heart are three men, victim, alleged killer and defense attorney, who are all fathers of daughters. It is a relationship that colors how each men acts or acted. It also shades how we feel about everything we see. It’s this additional level that lifts the film up from being a simple run of the mill mystery and makes it worth repeated viewings as you ponder not only what happened but the relationships. While a tad too leisurely to generate true nail biting suspense, The Third Murder still manages to hold your attention. It’s a film that draws you in and drags you along because you want to know the truth. The truth is a dicey thing in this film since, as one character remarks “no one tells the truth here”. Everyone has an angle. Personally I was so engrossed that when my cellphone went off at the moment of a key revelation I wanted to reach through the phone and kill the caller. I really liked The Third Murder a great deal. It is highly recommended when opens Friday at the Quad cinemas in New York.